It's "thank you" day here at May Dreams Gardens! Thank you to the generous family at Cobrahead for the "everyone wins" giveaway. Many of the winners are probably already receiving their short-handled Cobrahead weeders and putting them to good use in their gardens. 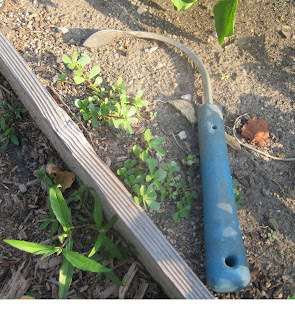 There is word that the weeds are planning a revolt, but I think we gardeners have the right tool to stop that now! Thank you to those who read my blog and leave encouraging comments. I really appreciate the comments and try to do likewise on others' blogs. I used to be more diligent about replying to comments in the comments section of my blog but have become more lax about that as life gets busiers. Just know that if you leave comment, I read it, enjoy it, sometimes savor it, and always appreciate it! Thank you to the many garden bloggers who I've had the privilege to meet in person and continue to keep in contact with beyond just through the comments back and forth on our blogs. Several have been particularly encouraging and supportive and I am very appreciative of that. Thank you to the rabbits and raccoons who seemed to have left my garden alone this summer. We live in peace. I have never harvested so many green beans. I like that. Thank you for keeping us informed, entertained, educated, amused and occasionally analyzed ... hi, Dr. H! Yeah for Thank You Days! Let's all remember to be thankful today! Thank YOU for keeping such a wonderful blog! Yes a BIG thank you for your informative and entertaining blog!! I will post my cobra when I get it. My husband and son were making a joke about, A free hoe is always good, especially short and curved!! Aren't men crazy? Thanks to you, too, Carol - the garden blog world is a better place for your enthusiasm, dedication and sense of community. Thank you for being such an inspiration and font of good ideas. Thank you day is one such idea. I love it. Thank you too! You are such an inspiration for me in my garden! And I think my rabbits may have taken a hint form yours this year, I'm starting to get tons of green beans! Thank YOU for this garden of respite on the 'Net. Thank you for the time you put into this blog (I can't believe you garden, work, write this blog and still find time to do other things). Thank you for sharing your wisdom and the mirth of the few times folly raises its head. Thank you. Carol, I have been gone for the past week and without internet access all that time, and now I see what all I've missed! Darn! I could have won a new Cobrahead. Good thing I bought one from Anneliese at the Home and Garden Show in Chicago last spring; how generous of the company to give one to all of your commenters. It really is a great tool and worth purchasing, for anyone who doesn't have one yet. just wanted to thank you for my new cobrahead! it arrived today and looks wonderful. too hot to work right now, but can't wait for early morning to see it in action..:) thanks again! Thank you for all of your thoughtful posts. You keep me in stitches as well as keeping me informed and entertained. I received my Cobrahead today and couldn't be more excited about pulling weeds. Thank you for hosting such a neat giveaway on your blog! And thank you for an informative, enjoyable site. Happy gardening to you, Carol! Carol: Thank you SO MUCH for this opportunity! My Cobrahead arrived today! I ran downstairs to show DH and he was impressed with the craftmanship and the design. I'll have it on my blog in a bit. Carol, thanks again for hosting this giveaway! My weeder arrived today, and I can't wait to try it out. Thanks so much to the Cobrahead company too! Carol, mine arrived today and I want to thank you for it. When I told my wife its name, she was glad it was not the real thing. I can't wait to torment my weeds with it. Your blog is one of the best Carol. Always fun and informative. How you have the time to work and garden and blog and comment I don't know. It was really nice to meet you last year and hope to cross paths again some day. Thank you, thank you!. My cobrahead arrived in the mail today. What a nice turn around time. I'm impressed. Now I have to put it to use. I got my new cobra head today and I thank you and the makers for this great new addition to my tool collection. That goes to show me that being pissed off about our heat and taking a break from blogging and commenting is NOT a good idea. You just never know what you're missing. Very cool idea, though!